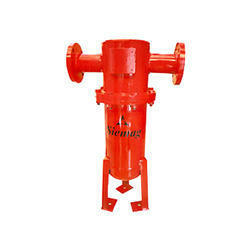 We are a leading Manufacturer of aluminium moisture separators and twin moisture separators from Mumbai, India. Moisture laden air enters and travels to the bottom of the vessel, where it is forced to pass through the directional diffuser which gives a centrifugal action. Water droplets as well as any other aerosols are intercepted by this diffuser. The spinning action of air while traveling through the diffuser impinges droplets of water on the wall of the separator & gets accumulated at the bottom. The balance aerosol-laden air then passes through the specially designed coalescing medium Vertically upwards. The aerosols coalescing to form into droplets & by virtue of their own weight, get pulled down by gravity. This two stage action of interception by the diffuser first and then by the coaleseor makes the Siemag Moisture Separator Very Unique. 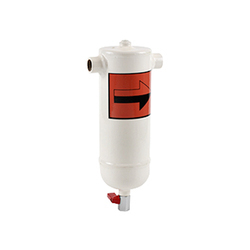 Moisture Separators have a purpose of removing the condensate obtained after cooling the compressed air which cases cooling the compressed air pneumatic tools, instrument & machinery. Two different methods for separating moisture laden air are baffle or centrifugal & coalescing type filtration. Each design posses the distinct problem of inefficiency or high cost. The centrifuge principle uses a Specially designed diffusor & a coalescor to guarantee maximum efficiency. The best of both world is achieved in this unique Siemag Moisture Separator which combines the simplicity & efficiency of the twin Separation method into one product that performs in a class of Its’ own.